Normally when a big-name video game releases a version on tablet devices, it's either a pared down version of the console experience or a completely different game altogether. 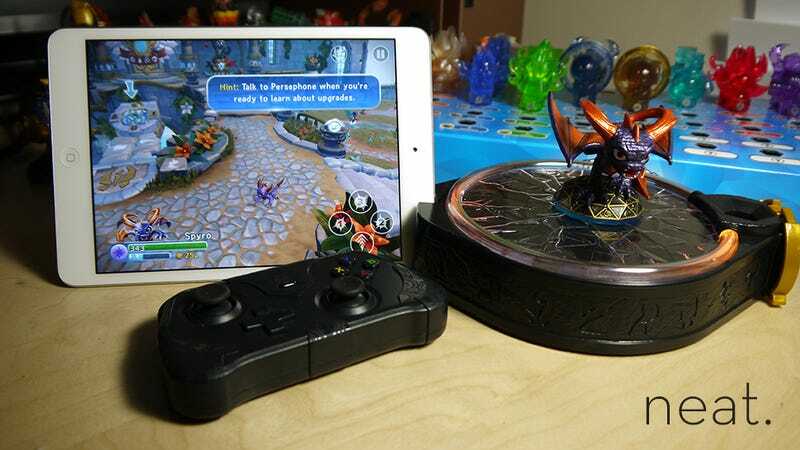 Not only is Skylanders: Trap Team's tablet offering the exact same game as on consoles, its portability and convenience makes it the superior version. The console version of Skylanders: Trap Team, releasing tonight at midnight in the U.S., includes a portal for beaming physical toys into the game, a pair of figures, two of the game's special crystal traps and a copy of the game on disc. The tablet version loses the disc (the game is downloadable on iPads, Android and Amazon tablets), but adds a custom-built controller and a special base that also acts as a tablet stand. The controller, which stows under the base when not in use, features all of the bits console players are familiar with — a directional pad, four shoulder buttons, two analog sticks and X-Y-A-B face buttons. It's on the small side, but so is the game's core audience. I've played for hours comfortably and I have massive monster paws. Slide a tablet featuring the game into the stand, connect the portal via Bluetooth (the pad and portal are linked, so if the portal is connected, so is the pad), and you've got the full console experience in compact form. On the iPad Mini Retina I've been playing on, the experience is comparable to that of the PlayStation 3 or Xbox 360 versions of the game. The PlayStation 4 version crams in some enhanced visual effects, but hopping from tablet to PS4 wasn't jarring. Less powerful tablets might run the game at lower settings (in my demo earlier this year, reps compared the performance on low-end tablets to the Wii version). Another caveat — the game will be huge when fully-installed. I haven't completely scanned in my collection yet, and the app is hovering a 6.8 gigabytes. It's the perfect version of Skylanders: Trap Team for parents fearing the impending television takeover. For kids, they've basically got an instant Trap Team workstation, where they can get down to the business of trapping some enemies. And should they crave the big screen expeience, that's what HDMI adapters and Air Play are for. As an added bonus, Trap Team tablet doesn't even require that controller or the portal. Without the controller, the game can be controlled via virtual touchscreen controls. Without the portal, players are given a pair of virtual Skylanders to play with. And since the internet is only required to download content and newly-added characters, once the game is loaded it can be played just about anywhere.